Like many other speculative fiction readers, it's thanks to George R. R. Martin that I discovered the excellent The Accursed Kings by French author Maurice Druon. As the main inspiration for A Song of Ice and Fire, I was eager to give this series a shot. The first two volumes were very good, but the third installment failed to live up to the expectations generated by its predecessors. The Royal Succession was a return to form for the author and I was looking forward to see if the fifth book would offer the same satisfying reading experience. The fourth volume ended with Philippe V's coronation, but The She-Wolf totally skipped over his reign and focused on the tale of his sister Isabella, wife of Edward II and Queen of England. Which was a bit odd, as previous installments followed one another rather closely. In the end, The She-Wolf didn't stand as well on its own as I thought it would. Maurice Druon continued to weave a vast number of threads in what is a great tapestry of men, women, and events that will shake the foundations of the kingdom of France and the rest of Europe. That hadn't changed. And yet, focusing more on the demise of King Edward II instead of the intrigues of the King of France's court, The She-Wolf felt like some sort of interlude and was a bit discordant in the greater scheme of things. Nevertheless, I was eager to discover what would happen next and was looking forward to reading The Lily and the Lion. Unfortunately, this one turned out to be more history textbook than novelization, and as such it was a disappointment. By far the weakest in the series thus far. Robert of Artois has been a central figure in this series from the very beginning. Indeed, he's been at the heart of every plot and intrigue, and I was happy to realize that The Lily and the Lion would more or less focus on him and his machinations. Manipulating people and events to place Philippe of Valois on the throne of France, it appears that this giant of a man will finally achieve his objective. And yet, over the years he has committed his share of mistakes, some of which will now come back to haunt him. 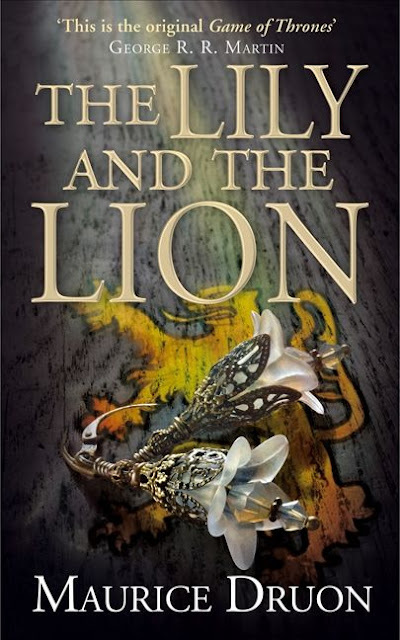 The first few chapters were quite interesting and The Lily and the Lion read as well as The Royal Succession. Problem is, a lot of characters are dead or dying, and the author has no choice but to do a lot of back-and-forth to remind readers of who they are, or who replaced them, with countless dates and interminable background information. Soon, as Robert continues to dig his own grave, so to speak, the prose becomes more history textbook than novel and that puts a damper on the overall reading experience. Sadly, this gets worse the more the tale progresses, and in the end it all but kills the book. Why Maurice Druon was unable to make The Lily and the Lion easier to get into, I have no idea. But there is no deying that it makes it hard to maintain interest the more you go on. And given that this book represents Robert of Artois' endgame, it's a shame. As always, I found the translation to be quite good. As was the case with the other installments, it is at times too literal, creating occasional odd turns of phrase. But other than that, there's absolutely nothing to complain about. Instead of relying on info-dumps, Druon once again opted for footnotes sending you to the back of the novel for more historical background and clarification. In the past, this usually maintained a fluid pace throughout. As I said before, in this day and age when speculative fiction and historical books are veritable doorstopper works of fiction, these novels are quite short. Too short, I've often felt. Not so with The Lily and the Lion, I'm afraid. Though it weighs in at 402 pages, due to the aforementioned problems the book felt much longer. The structure of these novels continues to revolve around a number of disparate POVs which allow readers to witness events through the eyes of a variety of protagonists. This helps generate more emotional impact, as you see the web of scandal and intrigue which weaves itself throughout all the storylines. The Lily and the Lion doesn't have the same "flavor" because many of the series' main characters have passed away or are now on the decline. As a matter of course, always in the thick of things, Robert of Artois' perspective is an important part of this novel. But the always entertaining Guccio Baglioni is dead and the Count de Bouville is senile. Spinello Tolomei is on the brink of death. Hence, many of the central protagonists of past installments are absent, or play very minor roles in this book. We get the perspectives of Philippe of Valois, King Edward III, Beatrice d'Hirson, and a few more. But for some reason, the sum of all those POVs is not as compelling as that of the previous volumes. And since The Lily and the Lion is itself an end of sorts, it will be interesting to see how Maurice Druon closes the show in the final installment, The King Without a Kingdom. Here's hoping that the last volume will recapture everything that made the first five books such enjoyable reads. I keep saying it: With family rivalries, politicking, betrayals and back-stabbings, ASOIAF fans will find a lot to love about Maurice Druon's The Accursed Kings. And given the fact that these books were first published back in the 50s, they have definitely aged well and are as easy to read as any contemporary novels on the market today. And although The Lily and the Lion was a letdown, I'm eager to find out how this series will end!